A list of connections currently open to a particular destination end-point. Definition at line 39 of file pconn.h. Definition at line 90 of file RunnersRegistry.h. Definition at line 34 of file pconn.cc. References capacity_, hash_link::key, hash_link::next, NULL, IndependentRunner::registerRunner(), theList_, and xstrdup. Definition at line 50 of file pconn.cc. References closeN(), hash_link::key, NULL, parent_, size_, theList_, PconnPool::unlinkList(), and xfree. Called after finalizeConfig(). Meant for announcing memory reservations before memory is allocated. Reimplemented in MemStoreRr, and IpcIoRr. Definition at line 51 of file RunnersRegistry.h. Definition at line 160 of file pconn.cc. References comm_read_cancel(), commUnsetConnTimeout(), debugs, Comm::Connection::fd, HERE(), and Read. Referenced by closeN(), findAndClose(), findUseable(), and pop(). Definition at line 113 of file pconn.cc. References clearHandlers(), Comm::Connection::close(), conn, debugs, hashKeyStr(), HERE(), PconnPool::noteConnectionRemoved(), NULL, parent_, size_, size_t, and theList_. Referenced by count(), endingShutdown(), Adaptation::Icap::ServiceRep::getConnection(), Adaptation::Icap::ServiceRep::handleNewOptions(), and ~IdleConnList(). Definition at line 63 of file pconn.h. References closeN(), conn, endingShutdown(), findAndClose(), findIndexOf(), i, isAvailable(), removeAt(), and size_. Referenced by Adaptation::Icap::ServiceRep::availableConnections(), Adaptation::Icap::ServiceRep::callWhenAvailable(), Adaptation::Icap::ServiceRep::excessConnections(), Adaptation::Icap::ServiceRep::handleNewOptions(), and PconnPool::unlinkList(). Called after shutdown_lifetime grace period ends and before stopping the main loop. At least one main loop iteration is guaranteed after this call. Meant for cleanup and state saving that may require other modules. Definition at line 323 of file pconn.cc. Called after parsing squid.conf. Meant for setting configuration options that depend on other configuration options and were not explicitly configured. Reimplemented in sslBumpCfgRr, and MemStoreRr. Definition at line 47 of file RunnersRegistry.h. Definition at line 284 of file pconn.cc. 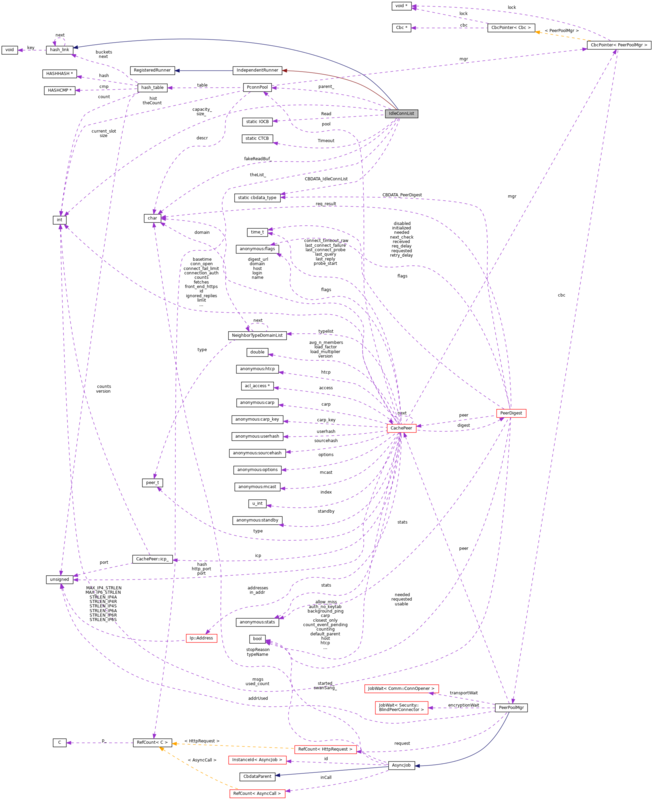 References clearHandlers(), Comm::Connection::close(), conn, CommCommonCbParams::conn, data, CommCommonCbParams::data, debugs, Comm::ERR_CLOSING, findAndClose(), findIndexOf(), HERE(), len, PconnPool::notifyManager(), parent_, Read, removeAt(), and Timeout. Referenced by count(), and findAndClose(). Search the list. Matches by FD socket number. Performed from the end of list where newest entries are. Definition at line 72 of file pconn.cc. References debugs, Comm::Connection::fd, HERE(), size_, and theList_. Search the list for a connection which matches the 'key' details and pop it off the list. The list is created based on remote IP:port hash. This further filters the choices based on specific local-end details requested. If nothing usable is found the a nil pointer is returned. Definition at line 245 of file pconn.cc. References assert, clearHandlers(), fd_table, i, Ip::Address::isAnyAddr(), isAvailable(), Comm::Connection::local, Ip::Address::matchIPAddr(), NULL, Ip::Address::port(), removeAt(), size_, and theList_. Definition at line 87 of file RunnersRegistry.h. Referenced by RunRegistered(), SquidShutdown(), testRock::tearDown(), and watch_child(). Determine whether an entry in the idle list is available for use. Returns false if the entry is unset, closed or closing. Definition at line 197 of file pconn.cc. References COMMIO_FD_READCB, conn, Comm::Connection::fd, i, Comm::IsConnOpen(), and theList_. Referenced by count(), findUseable(), and pop(). Definition at line 41 of file pconn.h. Definition at line 213 of file pconn.cc. References clearHandlers(), fd_table, i, isAvailable(), NULL, removeAt(), size_, and theList_. Definition at line 168 of file pconn.cc. References capacity_, comm_read(), commCbCall(), commSetConnTimeout(), Config, conn, debugs, fakeReadBuf_, HERE(), PconnPool::noteConnectionAdded(), parent_, Read, SquidConfig::serverIdlePconn, size_, theList_, Comm::Connection::timeLeft(), Timeout, and SquidConfig::Timeout. Referenced by PconnPool::push(), and Adaptation::Icap::ServiceRep::putConnection(). Definition at line 104 of file RunnersRegistry.cc. Referenced by ConnStateData::ConnStateData(), and IdleConnList(). Remove the entry at specified index. May perform a shuffle of list entries to fill the gap. false The index is not an in-use entry. Definition at line 90 of file pconn.cc. References debugs, hashKeyStr(), PconnPool::noteConnectionRemoved(), NULL, parent_, size_, and theList_. Referenced by count(), findAndClose(), findUseable(), and pop(). Called after receiving a reconfigure request and before parsing squid.conf. Meant for modules that need to prepare for their configuration being changed [outside their control]. The changes end with the syncConfig() event. Definition at line 63 of file RunnersRegistry.h. Called after receiving a shutdown request and before stopping the main loop. At least one main loop iteration is guaranteed after this call. Meant for cleanup and state saving that may require other modules. Definition at line 74 of file RunnersRegistry.h. Called after parsing squid.conf during reconfiguration. Meant for adjusting the module state based on configuration changes. Reimplemented in PeerPoolMgrsRr, and Auth::CredentialCacheRr. Definition at line 67 of file RunnersRegistry.h. Definition at line 96 of file RunnersRegistry.cc. Called after claimMemoryNeeds(). Meant for activating modules and features using a finalized configuration with known memory requirements. Reimplemented in MemStoreRr, SharedSessionCacheRr, TransientsRr, PeerPoolMgrsRr, ClientDbRr, SharedMemPagesRr, and Ipc::Mem::RegisteredRunner. Definition at line 56 of file RunnersRegistry.h. Definition at line 85 of file pconn.h. Referenced by IdleConnList(), and push(). Definition at line 96 of file pconn.h. Definition at line 19 of file hash.h. Referenced by accessLogInit(), aclMatchExternal(), MemStore::anchorToCache(), Rock::SwapDir::anchorToCache(), cacheIndexCmp(), StoreMetaMD5::checkConsistency(), StoreEntry::clearPublicKeyScope(), client_entry(), clientdbCutoffDenied(), clientdbEstablished(), clientdbGetInfo(), clientdbUpdate(), ClientInfo::ClientInfo(), Rock::SwapDir::createStoreIO(), CommQuotaQueue::dequeue(), destroyStoreEntry(), LeakFinder::dump(), CommQuotaQueue::enqueue(), external_acl_cache_add(), StoreEntry::forcePublicKey(), fqdncache_entry::fqdncache_entry(), fqdncacheAddEntry(), fqdncacheParse(), hash_join(), hash_lookup(), hash_remove_link(), hash_unlink(), StoreEntry::hashDelete(), hashFreeMemory(), StoreEntry::hashInsert(), hashKeyStr(), Rock::SwapDir::hasReadableEntry(), htcpQuery(), IdleConnList(), idnsCallback(), idnsStartQuery(), ipcache_entry::ipcache_entry(), ipcacheAddEntry(), ipcacheRelease(), LeakFinderPtr::LeakFinderPtr(), Fs::Ufs::UFSSwapDir::logEntry(), Store::Controller::markedForDeletionAndAbandoned(), my_free(), ipcache_entry::name(), neighborsUdpPing(), net_db_name::net_db_name(), netdbHashInsert(), netdbLookupAddr(), PconnPool::noteConnectionRemoved(), Ipc::StoreMap::openForUpdating(), Rock::SwapDir::openStoreIO(), peerCountMcastPeersStart(), StoreEntry::publicKey(), read_passwd_file(), Ipc::StoreMapAnchor::set(), StoreEntry::setPrivateKey(), StoreEntry::setPublicKey(), ClientInfo::setWriteLimiter(), snmp_meshCtblFn(), Ident::Start(), MemStore::startCaching(), storeDigestAdd(), storeDigestDel(), storeKeyPrivate(), storeRebuildParseEntry(), storeSwapMetaBuild(), UFSCleanLog::write(), Rock::IoState::writeBufToDisk(), ClientInfo::~ClientInfo(), ExternalACLEntry::~ExternalACLEntry(), fqdncache_entry::~fqdncache_entry(), ~IdleConnList(), ipcache_entry::~ipcache_entry(), and net_db_name::~net_db_name(). Definition at line 20 of file hash.h. Referenced by clientdbGC(), Store::LocalSearch::copyBucket(), StoreEntry::dump(), hash_join(), hash_lookup(), hash_next(), hash_remove_link(), hash_unlink(), IdleConnList(), LeakFinderPtr::LeakFinderPtr(), and lru_stats(). The pool containing this sub-list. The parent performs all stats accounting, and will delete us when it dies. It persists for the full duration of our existence. Definition at line 94 of file pconn.h. 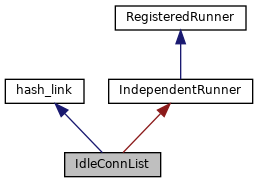 Referenced by closeN(), findAndClose(), push(), removeAt(), and ~IdleConnList(). Definition at line 73 of file pconn.h. Referenced by clearHandlers(), findAndClose(), and push(). Definition at line 87 of file pconn.h. Referenced by closeN(), count(), endingShutdown(), findIndexOf(), findUseable(), pop(), push(), removeAt(), and ~IdleConnList(). List of connections we are holding. Sorted as FIFO list for most efficient speeds on pop() and findUsable() The worst-case pop() and scans occur on timeout and link closure events where timing is less critical. Occasional slow additions are okay. Definition at line 82 of file pconn.h. Referenced by closeN(), findIndexOf(), findUseable(), IdleConnList(), isAvailable(), pop(), push(), removeAt(), and ~IdleConnList(). Definition at line 74 of file pconn.h. Referenced by findAndClose(), and push().